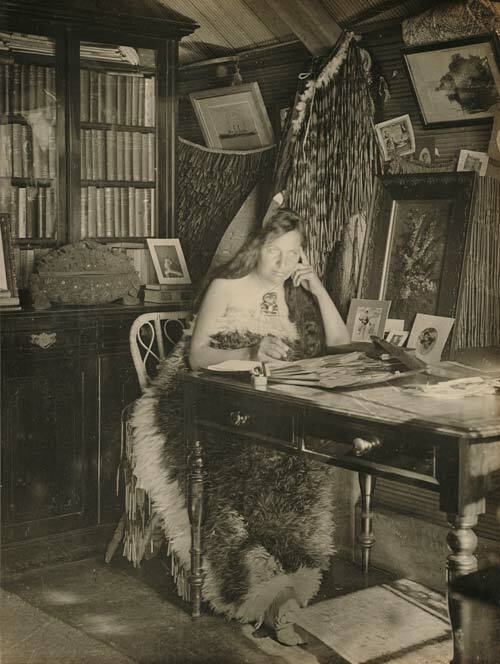 Mākereti (Maggie) Papakura is seen around 1910, probably in her whare at Whakarewarewa, Rotorua, surrounded by books, cloaks, photographs and carvings. In 1905 she wrote a Guide to the hot lakes district, and in 1926 enrolled in anthropology at Oxford University. Her thesis was based on a lifetime's collection of notes and journals on her Te Arawa people. She died suddenly just before it was due for examination, and it was published in 1938 as The old-time Maori. This was the first major Māori studies publication by a Māori scholar.